Eric Lamaze (born April 17, 1968) is a member of the Canadian Equestrian Team for show jumping. He and his best known horse, Hickstead, completed the rare feat of only having one rail fall during the entire Olympic Games. He was born in Montreal, Quebec. Lamaze was taught to ride at a young age by notable coach Diane Dubuc, in Montreal. Dubuc spent hours with Lamaze, helping him create a foundation for his career in jumping. Currently Dubuc runs a stable in Montreal called Day By Day Stables, where Lamaze still has ties. Lamaze has credited show jumping with helping him get past his tough childhood and turning around his life. Lamaze currently lives in Schomberg, Ontario, where he coaches at his own barn, Torrey Pines. In 2007, Lamaze became the first Canadian jumping rider in 20 years to make the top ten in the world rankings. He was also the first North American jumping rider to exceed one million in prize money a year, a third of these earnings came as a result of winning the CN International Grand Prix at Spruce Meadows. Lamaze was named to the Canadian team for the 1996 Summer Olympics in Atlanta, Georgia, but lost his place and received a four-year suspension after testing positive for cocaine. Arbitrator Ed Ratushny overturned the suspension, although Lamaze had already missed the Atlanta Games when the ruling was delivered. Lamaze rebuilt his career and ascended the rankings, being again regarded as a key member of the Canadian team for the Sydney Games. However he tested positive for a banned stimulant, which resulted in his removal from the team and facing a lifetime ban. Right afterwards, a despondent Lamaze contemplated suicide and while drunk he smoked a cigarette laced with cocaine. Forty-eight hours later, the test for the banned stimulant was reversed on appeal, however Lamaze then tested positive for cocaine which would also have meant a lifetime ban. Arbitrator Ed Ratushny overturned the cocaine test, but the Canadian Olympic Committee refused to reinstate Lamaze on the Canadian team. Lamaze competed in the Beijing Olympics, riding the stallion Hickstead. He was awarded a silver medal after a strong performance in the team event. Lamaze went on to win a gold medal in the individual show jumping event of the 2008 Beijing Olympics at the Shatin Equestrian Venue in Hong Kong as a result of a "jump off" between himself riding Hickstead and the Swedish rider Rolf-Göran Bengtsson, riding Ninja. After the untimely death of Hickstead in 2011, Lamaze selected the nine-year-old mare Derly Chin De Muze to ride at the 2012 London Olympics. In July 2016, he was again named to Canada's Olympic team, serving as the leader following Ian Millar's deciding not to compete again. Lamaze rode the Hanoverian mare, Fine Lady 5. As a member of Canada's jumping team, he competed in a climactic jump-off for the bronze medal, which ultimately went to the German team. Later, he won a bronze medal in the individual jumping event, a single knocked rail preventing him from earning a second gold medal. 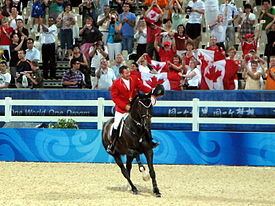 Wikimedia Commons has media related to Eric Lamaze. ^ a b c d Tom Harrington (July 20, 2008). "Finding faults". CBC Sports. Retrieved November 28, 2015. ^ "Lamaze wins equestrian gold". The Toronto Star. Retrieved November 28, 2015. ^ a b "Roll call of honour: Canada's medal winners". CBC. August 23, 2008. Retrieved November 28, 2015. ^ Cudmore, John (August 21, 2008). "Last medal winners applaud Beijing jumpers". The Markham Economist and Sun. ^ "Olympic show jumping champion Hickstead dies - ESPN". Espn.go.com. November 6, 2011. ^ "Eric Lamaze to ride Derly Chin De Muze at Olympics". Horseandhound.co.uk. July 18, 2012. Retrieved November 28, 2015. ^ Cleveland, Amy (July 14, 2016). "Eric Lamaze leads Canadian Olympic equestrian team in Ian Millar's absence". www.olympics.cbc.ca/. Canadian Broadcasting Corporation. Retrieved July 14, 2016. ^ "Eric Lamaze wins bronze in equestrian". CTV News. August 19, 2016. Retrieved September 1, 2016. ^ "Hickstead: loss of a true superstar | Horsetalk.co.nz - International horse news". Horsetalk.co.nz.